At Sketchfab, my job is to help the CEO and founders on everything organization related, to keep it smooth as it grows. My goal is to create the conditions for our organization to scale in a non-violent way. To get there, I believe in healthy team structures and psychological safety as basis for personal development and organizations performance. Together with my colleague Sarah, I act as main point of contact, both for our U.S. and French entities, for our accountants, banks, lawyers, and providers. Internally, I supervise our People efforts, including recruiting and benefits, onboarding and personal development, team building and internal communication, and advice the founding team on organization listening and emergence. As our team is still small, and before Sarah joined us in March 2019, I have been handling these roles by myself for more than two years. It's a lot of very small things you should not forget about, but it also requires to be able to step back and think about the organization and its dynamics as an independent living system. I needed to take a deep breath and reorganize. So over a month, I paid extra attention to the way I was working and tried to find solutions to bring some attention and focus back in. Bottom line was the belief that focus wins. Results came from better leveraging the simplest tools I was already using everyday: board, calendar, and inbox. For several years now, I used a very simple yet powerful notebook to keep track of my todos and notes: Evernote, but recently decided to move to Trello. Basically, all the meetings notes, thoughts, drafts I write down on a given week are stored in their own cards. For instance, if I am attending a meeting about our company analytics, I will simply create a new card for it, and gather all my notes there. I also use Trello to break down upcoming projects in advance. I try my best to leverage less busy times to start planning what the upcoming projects will look like: what will be step 1, 2 and 10, who will I need input from, what are the things that will for sure require time to be completed... The goal is to be as prepared as possible when projects actually start, most of the difficulties and potential road blocks being already identified. So I have handy, on a single board, all the pending little things and bigger projects I need to either move forward or follow up with others on, as well as an idea of what the upcoming projects will require. At the end of each day, I take 5 minutes to label in red the most important things I want to focus on the next day (the idea being to figure out what’s critical to do if my day were to end at 1pm), and in orange the rest I should dive in. Once again, goal is to decide and plan now, and be able to focus on execution the next morning. Google Calendar is often an essential part of the suite of tools we use everyday. It’s powerful to plan meetings, but I now also leverage it as a reminder for recurring todos. I realized my tasks include plenty of small things to not forget about. The simple fact of trying to keep them all in mind was a huge mental charge, disturbing me to be fully focused on important and more complex projects. 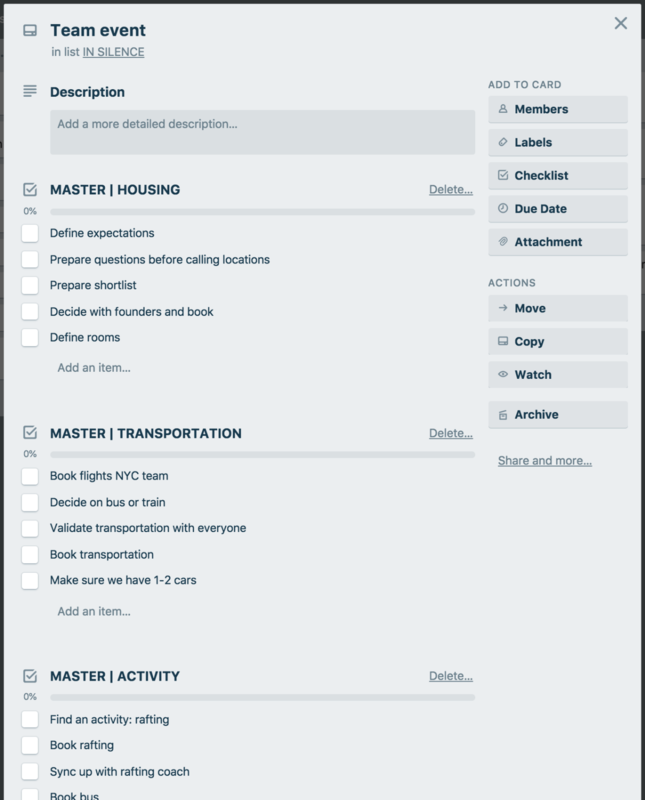 So I needed a tool to list all those little and recurring tasks and simply get reminded of them when appropriate. I ended up leveraging the 1:00-2:00am slot in my calendar to add recurring events. I also turned on a daily notification via email, to receive in my inbox at 6:00am my calendar for the day. It of course includes meetings, but now also all the recurring tasks that are due today. I found this little tweak to be extremely powerful. It indeed takes a little bit of time to identify the recurring tasks that could fit in this structure, and to create the events in your calendar with the appropriate recurrence. But once done, it becomes a no-brainer. You simply forget about them, and don't spend time to think about when it's best to take care of them. And more importantly: you forget about potentially forgetting them, freeing you up some mental charge for core projects. My inbox was the last part I needed to review. I realized I receive many kind of emails: urgent and/or important requests from the team and our partners ; conversations I got cc’ed in just for my information and to be able to step in if necessary ; forwarded NDAs, invoices, receipts... and I send requests and documents I need to follow up on. I now leverage labels to organize conversations depending on the level of attention they require, and have teached my inbox to filter incoming emails for me. Every conversation I need to keep taking a look at are now tagged as PENDING on top of their usual topic-specific labels. This is something I manually add when I feel it’s necessary. And every week, on Tuesday afternoon, I go through all those emails and follow up. This way, I’m sure nothing falls into the cracks. Based on the Founders' Time Management framework Alban introduced us, I now have a safe place for less urgent conversations. Each time an email comes in, if I consider that doing it now would disturb my attention and that I‘d better bulk it with others later in the day or the week, I label it LATER and mark it as read. So now, I have a pile of mindless and/or less urgent things I can dive in when I’m tired at the end of the day, or during Friday afternoons. I also started to systematically create action filters for any email I receive. Results come right away: incoming conversations or information got automatically forwarded to the right person, or labeled the right way. It saves a ton of seconds, but most importantly again, prevents you to be disturbed with all these things that could wait or be managed automatically. Don't spend too much time thinking about personal organization and using dozens of different tools. Goal remains execution.